There are Three Weeks that are an annual mourning period that falls out in the summer. 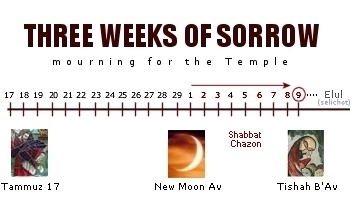 The Three Weeks or Bein ha-Metzarim (Hebrew: בין המצרים, “Between the Straits”) (cf “dire straits”) is a period of mourning commemorating the destruction of the first and second Jewish Temples. This is when we mourn the destruction of the Holy Temple and our launch into a still-ongoing exile. Those who mourn the destruction of Jerusalem will merit seeing it rebuilt with the coming of Moshiach. The final Nine Days of the Three Weeks are a time of intensified mourning. Starting on the first of Av, we refrain from eating meat or drinking wine, and from wearing freshly laundered clothes. © 2018 Assembly of Called-Out Believers. Use by Permission.